One weekend, I invited two of my college friends to come up to my house for the night. I had invited a big group of my mostly unemployed high school friends over to my house and we were going to grill in my backyard and, I guess, get wasted while listening to Michael Jackson, because he had died that week. Before the party got started, I was showing my friends Jen and Liza my bedroom, which at the time featured a framed poster signed by the cast of my high school’s production of Grease and approximately 700 issues of Rolling Stone stacked and organized by date. My friend Jen was looking through one of my many piles of “stuff” on my side of the room. “Yes,” she said. She was holding up a (CD) copy of Carole King’s Tapestry, like she was Rafiki and the CD was Simba except she was being at least a little bit ironic. I felt exposed. I hadn’t listened to Tapestry in years and there it was, sitting out in plain view in my bedroom. 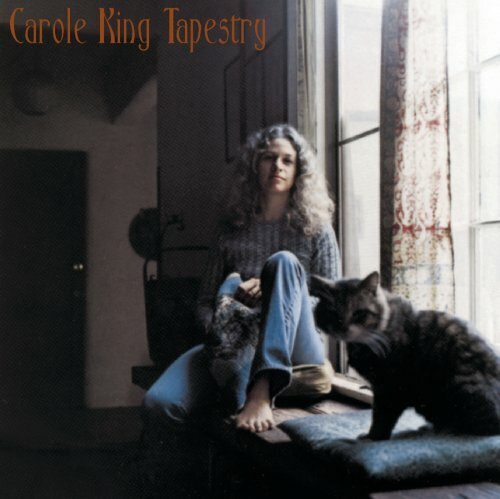 Anyway, I was thinking about this the other day because I’m going to a karaoke event in a few weeks where I’ll be limited to singing only “sad songs.” Putting together my list of possible songs, one of the first artists I thought of was Carole King. So I ended up listening to Tapestry and am glad I did. I have so many memories wrapped up in this album that I hadn’t, uh, remembered in a while. When I was very little, my dad used to sing me to sleep. One of his standards was “You’ve Got a Friend,” but in the style of James Taylor, I guess. We still listened to the Carole King version, obviously, but my dad is a dude, who also happens to like James Taylor. Anyway, that song – ugh, I know it’s cheesy, but I’m sharing something personal right now and I’d appreciate if you could stop judging me for one second – still makes me tear up when I hear it. “I Feel the Earth Move,” “So Far Away,” and “Where You Lead” were songs I grew up hearing on the radio constantly. My mom listened exclusively to 106.7 Lite FM, which I hated as I got older, but now appreciate for bestowing upon me an extensive knowledge of easy listening/soft rock/AM Gold. I don’t remember a time when I didn’t know those songs. By the time I reached middle school, I was stealing CDs from my dad’s collection and secretly listening to them. And Tapestry was one of the albums that I stole. (The CD that Jen found was probably my dad’s.) Why this listening had to take place in secret, or alone, I’m not sure. I suspect it had something to do with needing to experience something by myself in order to connect with it emotionally. The songs on Tapestry allowed me to imagine what it was like to feel things like love and loss – and other things too, but those are obviously the easiest/first things that come to mind – long before I would have those experiences myself. “Home Again” and “It’s Too Late” became “shower songs” – these are songs that I often sing in the shower – that I “practiced” while I was home alone in middle and high school, though I still find myself singing them once in a while. Which brings me back to the karaoke thing. After listening to Tapestry the other night – in my apartment, alone – I sang a few songs from the album while taking a shower. Quietly at first, and then louder once I remembered that my roommates weren’t home. A few weeks from now, I’ll be bringing one of these songs out of the shower and into the public eye – or, actually, a big karaoke room filled with mostly acquaintances – for the first time ever. In a way, my secret relationship with Tapestry is coming to an end.